Summer is now here as Monday marks the unofficial start of the season. The lakes, beaches and pools will be packed with boaters and sun-bathers. The coals from thousands of barbecue pits will fill the air with smoke and mouthwatering aromas. The three day weekend (for most) will see the running of the Indianapolis 500. Many area students will have already graduated or have graduation on their minds and their futures will be as shiny and bright as the last rays of sunlight reflecting off of a tranquil sea. It’s Memorial Day. Memorial Day, for many, is just an extra day off. For others, it serves as a reminder that freedom comes with a cost and is far from being free. Many courageous young men and women have paid said cost by making the ultimate sacrifice on the fields of battle so we may watch a race, go to the lake or have some smoked brisket. Old Army buddies from the First Armored Division, gather together to swap boozy stories of this guy or that girl and how funny they were along with some of the antics they got away with. They also tell the tale of how the same guy or same girl charged a machine gun nest or dived on a grenade to save their platoon. They regale in the stories of how their comrades were able to … and then bow their heads in remembrance of how their brother or sister-in-arms was killed trying to save the wounded. While in port to re-fuel, a bomb ripped through a ship, killing 17 and wounding 31 sailors. Outrage and sadness followed the bombing of the USS Cole in Yemen. The vast majority of the public, however, never see, hear or learn about the covert operations that went terribly wrong. Somewhere today, a young mother in Killeen dreads the ringing of the phone because the man she loves, the man she married and the father of her child, is somewhere in South America on a mission with the First Cavalry Division. She watches the television in horror as a Venezuelan city erupts in flame and prays for his safe return. Marines are thought of as tough. Yet most of us never see the tears they shed when their friend steps on a landmine in Afghanistan and loses his life. Their platoon leader won’t show any emotion in the heat of battle, but at night, alone with the thoughts of things that might have been, he weeps for the man he called a friend and dreads the letter he will write. The Air Force Major was on his last 30 days of active duty. He flew one more mission to observe enemy troop movements when his plane was hit by artillery and exploded. His remains were never found. These are the mothers and fathers, brothers and sisters, sons and daughters, nieces and nephews and just plain old friends who served our country in the United States Armed Forces. We will never see them again. Some were just out of basic training while others were nearing retirement. Some were on their 43rd assignment of walking point, while some were on their first. Some were just in the wrong place at the wrong time. The rights and freedoms we hold so dear, the right to free speech, freedom of religion, freedom of the press and the right to bear arms are awash in the blood of our military. When the first shots were fired at Lexington and Concord, the minutemen died so others might experience a life without tyranny. When American soldiers pushed into the town of Verdun, troops were lost. When the torpedoes and bombs sunk the USS Yorktown during the Battle of Midway, sailors died to defend our freedom. In the dense jungles of Southeast Asia, the arid deserts of Southwest Asia, or the barren mountainsides of the Korean peninsula or Afghanistan, United States military members have perished to protect our way of life. Memorial Day was established to commemorate the men and women who have died while in military service to the United States. First enacted to honor Union and Confederate soldiers following the American Civil War, it was extended after World War I to honor Americans who have died in all wars. 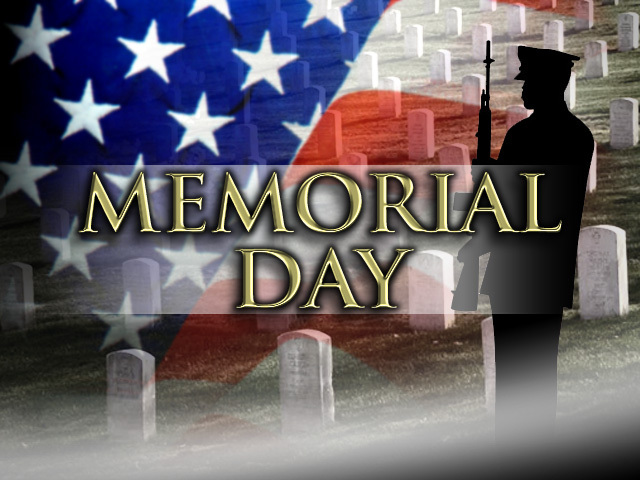 Take a moment this Monday to say thanks to those that have given all. Just for a minute, turn off the television, put down the suntan oil and stop the boat, close the lid to the barbecue pit (the ribs will be ok), put down your frosty beverage and say thank you. We are forever indebted to the bravery and courage these young men and women have provided to our country.